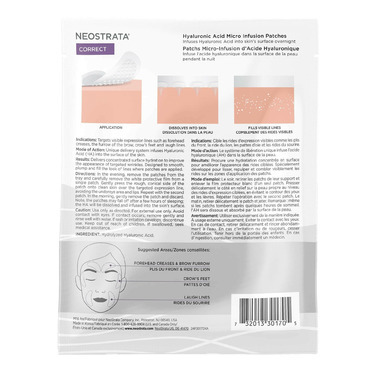 Inspired by professional medi-spa treatments these 100% Pure Hyaluronic Acid patches are the perfect at-home solution to smooth, plump and fill the look of your hardest-to-treat expression lines (crows feet, forehead creases, and laugh lines) with no downtime. 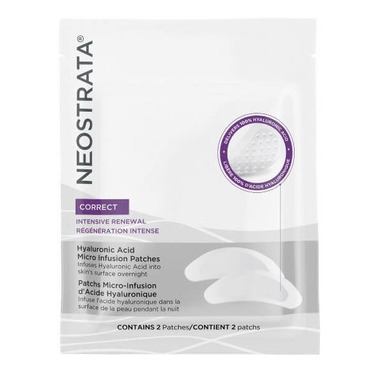 100% PURE HYALURONIC ACID (HA) in a unique melt-in delivery system infuses Hyaluronic Acid onto the epidermis to attract moisture, providing hydration to visibly improve the skins surface texture. In the evening, remove the patches from the tray and carefully remove the white protective film from a single patch. Gently press the rough, conical side of the patch onto clean skin over the targeted expression line, avoiding the undereye area and lips. Repeat with the second patch. In the morning, gently remove the patch and discard. Note, the patches may fall off after a few hours of sleeping;the HA will be dissolved and infused into the skins surface.